Crown Valley is Parker County's Premier Residential Community just minutes west of Downtown Fort Worth with easy access to Interstate 20. 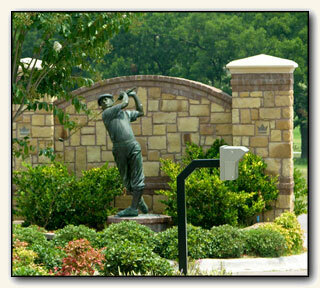 Crown Valley is an exclusive gated golf community that features custom and estate homes from $200,000 to $500,000 plus overlooking a highly rated USGA 18-hole championship golf course. Crown Valley provides the right mix of homes in the highly acclaimed Weatherford and Aledo School Systems, and high country living with city conveniences offering all city utilities in an exclusive neighborhood. 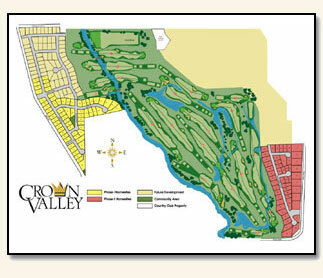 Crown Valley is an exemplary new home community that has plans for a spectacular ranchstyle clubhouse to be completed in late 2006 which will feature a PGA professional golf shop, private member dining facility to entertain clients and guests, a men's and women's locker room, a resort-style lifestyle swimming pool, tennis courts and a state of the art fitness center. With social and full memberships, Crown Valley allows residents & friends to enjoy a country club lifestyle only minutes from the major metroplex and less than a mile from beautiful Lake Weatherford. Visit Crown Valley today and select one of these homes in an exclusive neighborhood of only 300 home sites. Several of our builders have home-shopping incentive programs that come with the purchase of your home. Voted by Texas Golfer Magazine as one of the Metroplexes' 10 Best Golf Communities, become a resident of Parker County's Premier address and afford yourself the opportunity for high country living. Prices, features and dates are subject to change. All plans for facilities or land uses are subject to change without notice and nothing presented on the plan should obligate Crown Valley Acquisitions, LP or any other entity, public or private, to construct facilities or to develop the land as described. Actual construction or changed development may have already rendered the information presented in this plan. 2006-2007.